Hey Activists, This Wearable Projects Video Graffiti #WearableWednesday « Adafruit Industries – Makers, hackers, artists, designers and engineers! I’m having some serendipity with wearable tech lately, and this video projector I found on Bits & Pieces is exactly what I’m talking about. Recently I met with a group of people interested in doing video projection on buildings. As you may know, this gets tricky as the equipment is somewhat bulky. Usually someone is madly peddling a bike contraption with a projector mounted on the front for a quick getaway. Of course, there is also a mega battery or generator involved adding to the awkwardness. 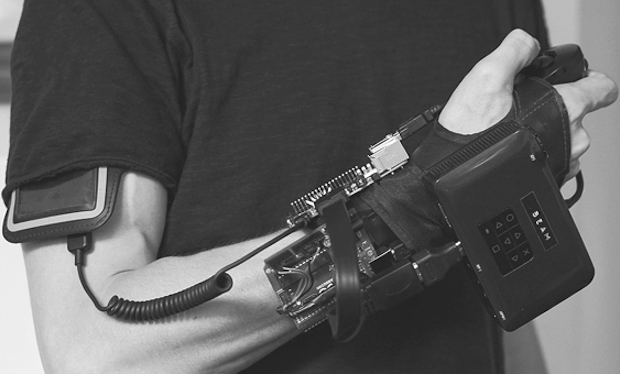 This VIDEOBLΛST_R solves all the issues with a forearm mounted unit, powered by a 5V DC Powerbank worn on the upper arm. Check out the projections—sweet! The creator, RA, is a cyberpunk underground artist from Moscow that not only plays with glyphs, but also knows a thing or to about electronics. He’s got a cool combo of boards strapped to a Rollerblade wrist guard including a Raspberry Pi (to handle the Processing), and an Arduino Uno and a WII Nunchuk (which operate the button pushes for the animation). This all ties into an Optoma PK-320 projector, making for a very small package. Not only does it do a decent job of projecting, but the person doing the video art gets to look like Ultraman. You can only imagine how handy this device is going to be for the next artistic protest or for the party with the fashionable VJ. You can bet I’ll be sharing this info with my video group, and I really hope that RA is considering making a tutorial. 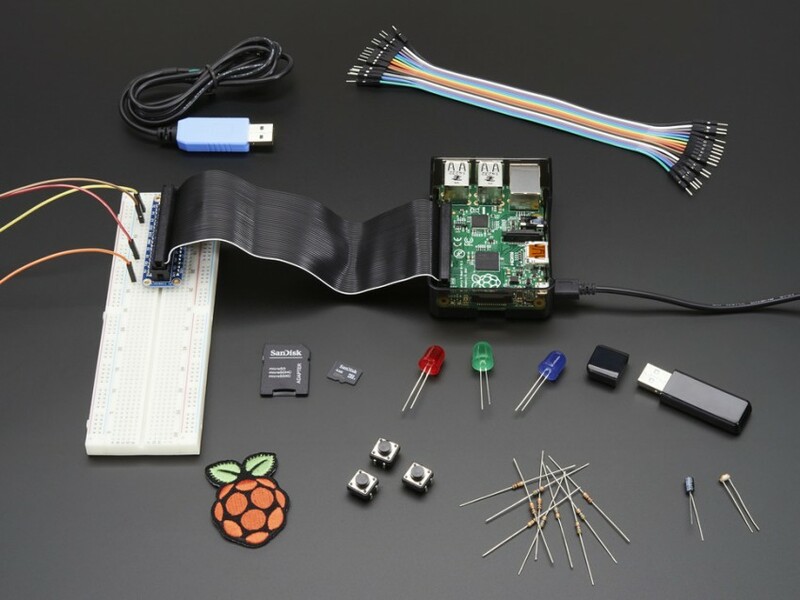 One thing is certain, it’s a good time to pick up a Raspberry Pi 2 Model B Starter Pack. It’s got the tiny computer that everyone loves along with the things that make it readily usable like a power supply, a protective case, a USB WiFi module, an SD card with Raspbian Wheezy, a pre-soldered Pi Cobbler Plus (to make it easy to start prototyping), a breadboard and a bunch of cool parts to get started. As a bonus, there is also a Raspberry Pi patch, because after you have created your first project, you are going to want to show off that knowledge with some swag. So, have fun learning about Linux and send us pics of what you end up making!